I’ve been really looking forward to reading this, so I’m glad to see Tony gave it the thumbs up! I loved Haroun and the Sea of Stories, and also found that there were plenty of undercurrents to enjoy in addition to the wonderful and playful storytelling. I’m a Rushdie scaredy-cat, and I’m not afraid to admit it! It’s those page long sentences that made me run screaming from the one book I tried. LOL You crack me up! Like Ana, I’m a fan of Haroun and the Sea of Stories (and all his other stuff), so I’m curious to see what he’ll do with a YA book! If I hadn’t just finished The Moor’s Last Sigh, I’d probably request this now…that cover is too beautiful. Actually, when i see the word “Rushdie”, what races to mind is Bridget hoovering in her pants and practicing the pronunciation of his first name. Though i’m not going to pretend to have actually finished the one book of his that i own (and it was a collection of shorter writings, which i guess makes it worse). But most importantly: “bucket list”?? I’m sorry, i guess i missed the bit where you became a septuagenarian with a love of bad movies. That’s so me — I’ve never read Rushdie, and though I want to, I’m a little scared! I bought some of his nonfiction in the hopes that it less scary. I think it will be, though I haven’t gotten to it yet! I think I’ll take your advice and ease myself in with Luka. Before reading this one, I would recommend people to read Haroun and the Sea of Stories first, another great introduction to Rushdie’s fab writing style! @ Nymeth: One thing I love about Rushdie in general (though I’ve only read one thing by him, so who am I to generalize?) is how playful he is! You wouldn’t necessarily expect a book called “The Satanic Verses” to be so funny, and yet it was! @ softdrink: Oh, I completely understand that fear! It took me three tries to make it through the first 20 pages of The Satanic Verses, and I was sure I’d never be able to read it. I’m glad I’m stubborn though, because I really wound up liking that book a lot! @ Eva: Yes, I think it would be really interesting to see Rushdie’s take on YA writing. Normally I am disappointed by YA novels, not for their ideas, but because I do think that they sometimes sacrifice quality of writing in ways that aren’t necessary… somehow I think that Rushdie won’t fall into that trap! But I agree, Bridget in her undies intoning “Salmaaaan” is definitely a token Rushdie image! @ Erin: Oh see, I always find non-fiction scarier, so this would be the place I’d want to start… provided I hadn’t already read something by Rushdie, which I have, so it’s really a non-issue as I’ve managed to face my fears! You can do it too! @ Nishita: This is somewhat of a sequel, so I’m sure it’s not a bad idea for others to read Haroun first… but that said, Tony didn’t read Haroun before this and I don’t think that mitigated his enjoyment at all. @ JoV: I think it’s so great you’re doing a Midnight’s Children readalong! It’s actually the Rushdie book I’m most excited for – I just know I will love it. So of course I’m hoarding it because I don’t want to rush it! I am new to your blog, Steph – I discovered it through Eva’s blog and it looks wonderful! I really enjoyed reading this post – it made me smile 🙂 I liked very much your observations “even more chilling “Booker Prize winner”” and “it’s also satisfying storytelling for those who’ve already braved the man and lived to tell the tale” 🙂 Do you write like this always? The covers of his books always great (love that one). I’ve read Midnight’s Children and The Ground Beneath Her Feet and enjoyed both. Have Shalimar the Clown on the TBR shelf. I have been reading great reviews of this book all over the place and really want to read it! I have read a little Rushdie, but got tripped up with The Satanic Verses. I am going to be trying again, though, and hope that this time I make it through! Your review of it really inspired me, actually. Off to check out Tony’s review now! Shame and The Satanic Verses are on my bucket list but really his back catalogue is. Midnight’s Children is such a surprise of a gift in a box with layers and layers of wrapping. I picked up a copy of Luka whilst at Random House (and seeing the man himself); should I read Haroun and the Sea of Stories first? I’m currently reading my first Rushdie (Midnight’s Chilren) and am enjoying it a lot. Can’t wait to see what Rushdie comes up with for a YA audience. @ Vishy: Welcome! And I do hope you enjoy yourself here… I like to think I’m always as witty and playful as I was in this post, but I’ll let you be the judge of that (after all, sometimes I am cranky and curmudgeonly…). Tony and I can both highly recommend The Satanic Verses (our reviews are in the archives); it’s by no means an easy book, but it’s so worth the effort. It’s also not nearly as daunting as you might think! Definitely good, good stuff. @ Alex: I agree that Rushdie’s books generally have great covers, though I will say that our copy of The Satanic Verses is U-G-L-Y. Oh, but dude, I totally agree with you on Umberto Eco. He is an author I have attempted and never made it through. I also think I never will. He and I are just not meant to be besties. @ zibilee: I’m so glad to hear that our reviews of The Satanic Verses have made you want to try it again. I do think it’s a book that takes a bit of time to adjust to in terms of style but I think the payoff is worth it. I do hope you give it a try again one day! Reading Haroun first certainly wouldn’t hurt, but Tony didn’t seem to feel his not having read it was a problem at all. I’d say reading either book in either order would be fine! @ Bina: So glad to hear your enjoying your first Rushdie… I think he can be a lot more accessible than people give him credit for. Hopefully Luka will help bring others over onto his side! @Claire: Steph is right about Haroun, in fact I didn’t even know it existed until I picked up my copy of Luka and started doing some research. 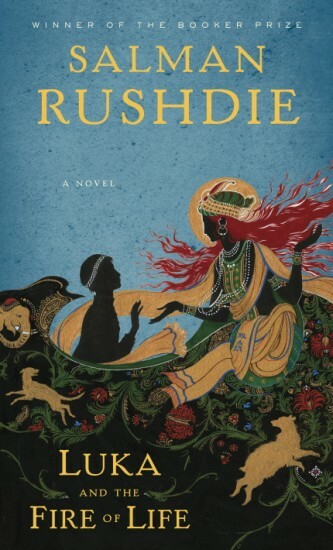 @All: This is certainly among Rushdie’s more accessible works. It’s a good way to get a sense of his language and idiomatic devices, without being overwhelmed by the scope of his story, as some can be by his larger works. Yay, I’m excited to read this! I have been nervous about Rushdie, but want to read him. I’ll have to get it from the library soon. Oh, I’m glad Tony enjoyed it! I am looking forward to this one. While I’m not a COMPLETE Rushdie virgin, I do avoid those massive tomes like Midnight’s Children and Satanic Verses… I will try this one first before giving those a go! I’m so glad Tony approved of it, as I was scared it would get the same bad reviews as Enchantress (which, even so, I’d still love to read). I also loved Haroun, so looking forward to this! I read Haroun and the Sea of Stories in college and enjoyed it quite a lot. I’ve also read Midnight’s Children. I’m not sure when I’ll read Rushdie again, but this one would be a good one to turn to. I might assign Haroun in a class of my own one day, since it’s such a fun book and has a lot of good ideas to talk about.